Grease a lined 22cm round cake tin. Cream butter, vanilla essence and sugar until light and fluffy. Add eggs one at a time. Sift cocoa, flour and baking powder together. Add to creamed mixture. Add milk slowly. Pour into cake tin and bake for 30 minutes. Make a round cake, four small rectangular cakes and one loaf so you’ll have all the pieces you need to make the dragon. I did a ‘crumb coat’ of the icing first, which I left for a few hours. This sealed in the crumbs and stopped them from coming through the top layer of icing. It’s a great technique that gives your cake a more professional finish. The hardest part was getting the scaly texture of the icing to look deliberate and dragon-like. 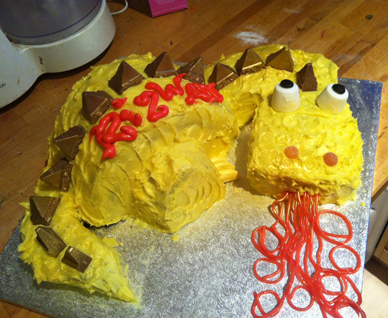 When all was done I added edible gold spray to make the dragon sparkle. I have lived in Hackney for more than 10 years and love this community. I volunteer with a few local organisations and thoroughly enjoy being as involved as I can in things going on in this vibrant corner of London. I have baked quirky – and sometimes downright weird – cakes for friends and family for years but volunteering with Free Cakes for Hackney Kids gives me the chance to try some of the fun creations that children appreciate. I am loving every minute of it and looking forward to the next challenge. I like the anonymity of making a child or family a cake – it’s a bit like being a baking fairy! « We’re in Craftseller Magazine!